AppleInsider told you back in May about "General Magic," a new documentary, directed by Sarah Kerruish and Matt Maude, about a group of Apple veterans who started the company of that name in 1990. The company, whose principals included such Apple names of the past as Andy Hertzfeld, Joanna Hoffman, Bill Atkinson and Tony Fadell, developed a product that resembled the smartphones of today, albeit 15 years too early. The product was a failure, and the company later folded and was largely forgotten. The film about the saga is still applicable today, and has a lot of lessons about technology, creativity, and how great ideas sometimes have the worst timing. 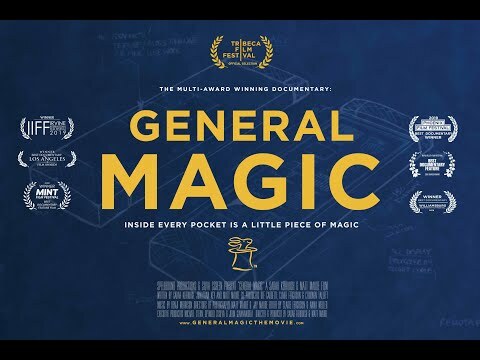 The wide release date for "General Magic" is unknown, but it remains on the festival circuit. Just this week, another General Magic veteran, John Giannandrea, was given control of both Apple's Machine Learning and Siri teams. Nowhere right now. As the article states it was at the Tribeca Film Festival earlier this year (20 April 2018), and will be shown in San Jose on July 26th. No other info on a theatrical or streaming video release is known. Keep an eye out for your local film festival and support it early if it is coming to a town near you. Or wait a couple of years and see it on a streaming service somewhere. And now we have exciting vaporware companies like Magic Leap... interesting they both have the word "magic" in their company names, eh? Looks like the kind of documentary I would like! A mis 70 year, and for those who did not follow the news, allow me to tell the happenings. General Magic was not a failure, along with other developments at Apple, they were the most advanced ideas created by a technological company. However, they were destroyed by the then almighty power of Microsoft, who exercised a dark influence over the techno world, and they were ALWAYS pre-emptying all the ideas of Apple with concepts they never materialized. Years later came the dep of justice and its reach of monopoly due also to the complain of every major tech company (for blackmailing), most of them non-existent today. In fact the 25 millions dollars investment in classes B share of Apple by Microsoft to offset the investigation of the fiscal in 1997 was followed with the following text “ Microsoft support the competition and for such endeavour we are investing in Apple”. Investment which lasted only 3 moths before the sold the shares. It was transformed by the dark forces of Microsoft as a loan to Apple by Microsoft of constant ballooning amount (by now it has reached 600 millions? ), which never occurred, indeed! by passing all the economics concepts of money trading by those experts in economics. Apple at the time (1997) had 500 million outstanding shares, 12 billions sales at year and 3.600 millions dollars cash in back and convertibles bonds, review Apple income statements and balance sheets. Wait Apple owned General Magic?? Not so sure... there were ties between the 2 as 2 of Cupertino's star software guys helped found it.